Photo: Skidmore, Owings & Merrill LLP. 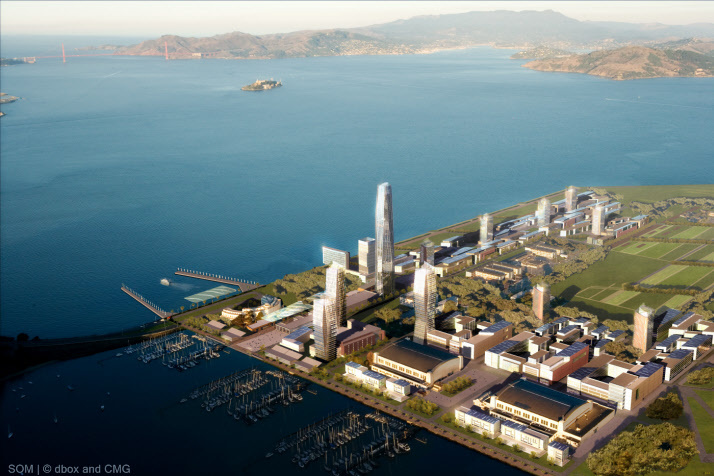 The massive redevelopment of Treasure Island in San Francisco Bay has cleared all regulatory hurdles and is now officially green-lighted for construction as early as next year. But the project’s eco-credentials are still in dispute. As San Francisco Mayor Ed Lee signed off on the project last week, environmental groups were pondering a lawsuit. They’re calling the $1.5 billion project to remake the former military base too car-centric to be labeled “sustainable.” And they say housing as many as 19,000 people on bay fill is too risky with the triple threat of earthquakes, tsunamis, and sea level rise. “We should rename this not ‘Treasure Island’ but ‘Fantasy Island’,” said former San Francisco supervisor Aaron Peskin on a recent episode of KQED’s Forum. Peskin joined environmental groups — the Sierra Club, Wild Equity Institute, Golden Gate Audubon, and Arc Ecology – and island resident Kenneth Masters to call for further environmental review. They claim that city officials violated the California Environmental Quality Act because the project description lacked enough details for a thorough review of environmental impacts, among other complaints. The city contends otherwise. To assuage critics about traffic, city officials and the project developer, Lennar Corp., lowered the number of parking spaces on the island by 470. But critics still complain that 10,680 spaces – one per household, which is more than San Francisco – is still too many. The environmental groups say that all those cars will jam an already congested Bay Bridge and prevent public buses from achieving speedy service for island commuters. The major public transit feature, a high-speed ferry to downtown San Francisco, will run every 50 minutes — far too infrequently for busy commuters, critics contend. Roughly half the island residents are expected to commute by car. The project still has plenty of supporters because other aspects read like a laundry list in sustainable design: solar power, plenty of open space, an organic farm, cluster development, and energy efficiency. For those groups opposed, taking the city to court may be the only other option for a do-over. But for cash-strapped non-profits going to court is a tough choice. They have 30 days from the time of city approval to make a decision. I would like to know what Zurich RE would charge for a long term flood insurance policy, considering the effects of sea level rise. Should be an interesting number. Someone needs to seriously look at how utility services are to be provided to TI. In particular, the SFPUC cannot pump all the wastewater onshore and the existing facility is falling apart and not seismically safe which means building a new treatment facility on TI. This will cost 10s of millions. How is it to be paid for? The lack of bicycle access is an issue as well. It’s time (actually past time) to convert one lane on the Bay Bridge to a bicycle lane. Convert one lane to just bicycles eh? I ride to work everyday so I’m cyclist. But your idea is a PERFECT example of why motorists (the bulk of society) is literally hostile to cyclists. Cyclists cry; “Share the Road!” But what you are proposing is “Taking away the road” and puts you in direct hostility to drivers. If you want to share the road fine, create space that doesnt take away car space. But if you intend to reduce auto access & take away space from cars dont be surprised at hostility and antipathy towards you & your efforts. This is why more and more, you see stories about motorists literally running down individual and groups of cyclists – the building rage against taking away space on an ever more crowded road. Akin to taking food from starving people. Maybe cars should go away but until they do, and as they do, expect auto drivers to become more and more militant and hostile to attempts to take away their vehicles & space. And we all know CAR v. BICYCLE = dead cyclist. I live on Treasure Island and I support the new plan. I belive that the developers have taken everything in to considerration and that when the new wonderful island is done we will be able to say to the people that could care less about the residents we told you it was possible, we told you so!! My guess is the majority of people that are talking about lawsuits have never been to the island!! So let us have our new updated Island!